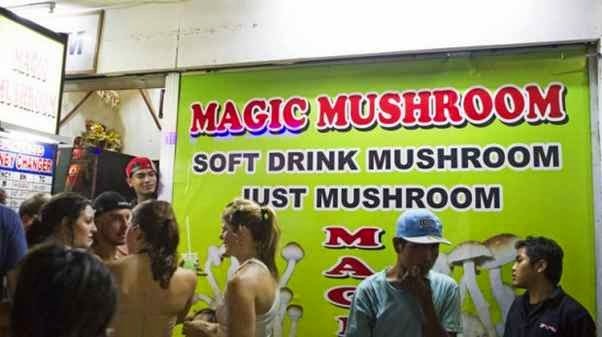 Bali Police banned the sale of mushroom in Bali, because the fungus is already entered in the class of drugs. Prohibition of fungi known as magic mushrooms is done by issuing circulars. The letter was addressed to the owners of restaurants, bars, discos, cafes, and hotels that were previously sold openly mushroom fungus. The police has been informed to all parties, particularly the drinks merchant who sells mushroom openly. The circular ban has also been given to the seller mushroom, socialization in the media and to the public has also been made that the sellers of Bali region know that mushrooms are dangerous and can harm anyone. Bali Police had since 1 September 2014 and do the dissemination to the public and businesses, especially in the tourist area of Nusa Dua, Legian, Kuta, Sanur, and Jimbaran, there is lots of bars, discos and cafes. Police urge all businesses to stop trading mushroom entertainment in any form. During the socialization period will be coaching and monitoring. Decisive action and punishment for mushroom sellers will be made from January 1, 2015. Police have put up banners, and distribute brochures during the process of socialization since 1 Septemberyang ago. Police to provide guidance in advance, disseminate to the public, this time people do not know the dangers of mushroom. Since socialization and publication of the circular, mushroom sales numbers now begin a little. Mushroom fungus has been included in group one type of drug. But among young people is still much to consume to get the hallucinogenic effects. Hallucinogenic effects that appear after eating mushrooms can feel happy excessive, exaggerated fears, and even suicide. These cases have occurred in Bali. Consumers and users mushroom in Bali very much. Many foreign tourists who use the mushroom during a visit to a discotheque, to give the effect of a high and happy feeling. Before police officially banned the sale of mushroom, Magic Mushroom is very easy to get in Kuta, Sanur, Seminyak, and Denpasar. Even sales of mushroom can provide great advantage for traders, because this fungus can be easily obtained in nature and are sold with a mixture of fruit juice to be given to the buyer.